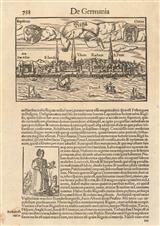 Description: A panorama of the Latvian city Riga with descriptive text on lower half and an inset image of a woman holding a rose. From Munster's, 'Cosmographia'. Description: Three maps on one sheet showing the Baltic States, Pomerania and the Dukedom of Oswienczensis in Southern Poland. Original colour. Description: Estonia and Latvia. Decorative Dutch Golden Age map of the region by two of its leading cartographers, Gerard Mercator and Jodocus Hondius. Elegant strapwork title cartouche. Original hand-colour. 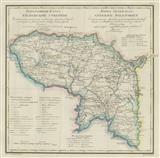 Description: A hand coloured miniature map of the Baltic States. Description: Early map of the Baltic States with rich original colour. Shows modern day Estonia, Lithuania and Latvia. Strong impression. Published as part of Hakluytus Posthomous or Purchas his Pilgrimis, contayning a History of the World in Sea Voyages and Lande Travells, by Englishmen and others. Description: Estonia and Latvia. Rare Michael Sparke edition with English descriptive text on verso. Coloured. Description: Livonia. Beautiful map in original colour embellished with ships and decorative cartouche. Description: Early city plan of Riga in bird-eye view perspective. Coloured. Description: Early and important map of the Baltic States based on maps and surveys obtained by Adam Olearius, ambassador of the Duke of Holstein to the Archduke of Muscovy and the Shah of Persia. English edition. 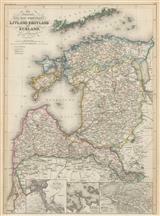 Description: Visually stunning map of the Baltic States with rich original colour. Shows modern day Estonia, Lithuania and Latvia. Embellished with an elaborate cartouche. Description: Latvia, Estonia and part of Lithuania, Belarus and Russia. Inset maps of Riga, Jelgava and Tallinn. German text. Original hand colour. Description: Russia in Europe focussing on the Baltic States. Detailed map with original outline colour. Description: Plan of the harbour at Liepāja, an important port in Latvia due to it being ice-free. Printed colour. Description: Map of Riga, Latvia, emphasizing the facilities of its port. SL.